Sunstone's tasting room is reminiscent of some of the small wineries in the Provencal French countryside. The gorgeous courtyards and picnic grounds, surrounded by vineyards, provide the perfect place to experience the wines. 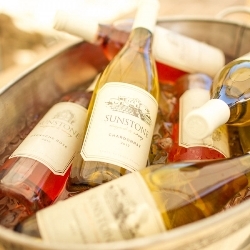 Tucked on the edge of the Santa Ynez River, in the heart of Santa Barbara Wine country, Sunstone Vineyards, Winery and Villa is also a beautiful event destination that greets your guests with the delicate fragrance of French lavender and rosemary.